The Law Project for Psychiatric Rights (PsychRights) is a non-profit, tax exempt 501(c)(3) public interest law firm whose mission is to mount a strategic litigation campaign against forced psychiatric drugging and electroshock in the United States akin to what Thurgood Marshall and the NAACP mounted in the 40's and 50's on behalf of African American civil rights. 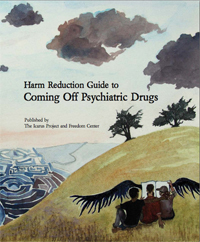 The public mental health system is creating a huge class of chronic mental patients through forcing them to take ineffective, yet extremely harmful drugs. As part of its mission, PsychRights is further dedicated to exposing the truth about these drugs and the courts being misled into ordering people to be drugged and subjected to other brain and body damaging interventions against their will. Due to the pervasive psychiatric drugging of children and youth, PsychRights has made attacking this problem a priority. Children are virtually always forced to take these drugs because it is the adults in their lives who are making the decision. This is an unfolding national tragedy of immense proportions. 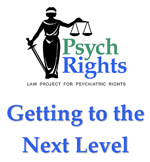 PsychRights is seeking substantial funding in order to increase its effectiveness. See, Getting to the Next Level. Briefing Paper: The Financial And Societal Costs Of Medicating America's Foster Children: A Proposed Solution: Enforcement of Medicaid's Restriction of Covered Outpatient Drugs to Medically Accepted Indications, to Sen. Mark Begich, U.S. Senate Subcommittee on Federal Financial Management, Government Information, Federal Services, and International Security, December 12, 2011. Treatment Planning and Medication Monitoring Were Lacking for Children in Foster Care Receiving Psychotropic Medication, by the Office of the Inspector General, U.S. Department of Health and Human Services, September 17, 2018. Disability Rights Maine Complaints Lead to First Steps In Stopping the Criminalization of Mental Illness In the Lewiston-Auburn Area, August 30, 2018. Patterns of Early Mental Health Diagnosis and Medication Treatment in a Medicaid-Insured Birth Cohort, by Dinci Pennap, MPH; Julie M. Zito, PhD; Paramala J. Santosh, MD, PhD; Sarah E. Tom, PhD; Eberechukwu Onukwugha, PhD; Laurence S. Magder, PhD, JAMA Pediatrics, doi: 10.1001/jamapediatrics.2018.0240. Psychotherapy v. Medications: Let us Court the Ways, National Alliance of Professional Psychological Providers, Feb, 2017, Vol 12 No. 2. 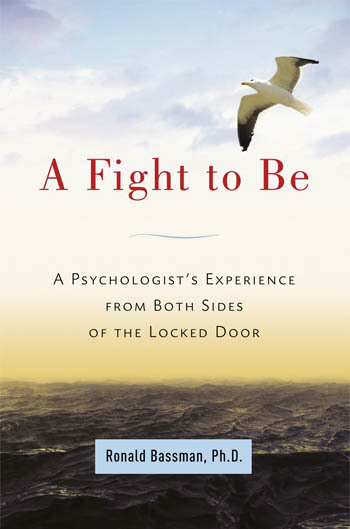 "Prior psychiatric treatment was the single strongest predictor of suicide death," J.D. Ribeiro, J.C. Franklin, K.R. Fox, K.H. Bentley, E.M. Kleiman, B.P. Chang, and M.K. Nock, Letter to the Editor, Psychological Medicine, 46 (2016). Opinion: Misguided mental health system needs an overhaul, by Jim Gottstein, January 13, 2016, Alaska Dispatch News. Escape from British Columbia, Rob Wipond, Focus, November-December, 2016. 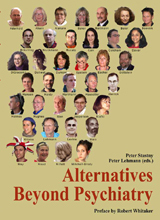 Exploring Psychiatry�s �Black Hole�: The International Institute on Psychiatric Drug Withdrawal, by Kermit Cole with videos from the Conference on PsychoPharmaceuticals: Risks and Alternatives: a Scientific Symposium, in Gothenburg Sweden, October 8, 2016, sponsored by the Extended Therapy Room and the International Institute for Psychiatric Drug Withdrawal. New Video: Schizophrenia Drugs Reduce Recovery Rates from 80% to 5%, October 7, 2016. The Case Against Antipsychotics: A Review of Their Long-term Effects, by Robert Whitaker, Mad In America Foundation, July, 2016. Precursors to suicidality and violence on antidepressants: systematic review of trials in adult healthy volunteers, by Andreas � Bielefeldt, Pia B Danborg, and Peter C G�tzsche, Journal of the Royal Society of Medicine; 2016, Vol. 109(10) 381�392. Lawsuit filed on behalf of psychiatric patients claiming they were isolated nearly 24/7 for nearly a year, by Holly Michels, Billings Gazette, September 16, 2016. Is the Evidence Strong Enough to Warrant Long-Term Antipsychotic Use in Compulsory Outpatient Treatment? by Shawn S. Barnes, M.D., and Nicolas Badre, M.D., Psychiatric Services 67:7 (2016). PsychRights letter to the Alaska Mental Health Trust Authority Planning Committee, June 15, 2016. The Search for Schizophrenia Genes: Larger and larger samples are showing smaller and smaller effect sizes. What does this mean for drug development, clinical practice, and our view of mental illness? by Jonathan Leo, Slate, February 5, 2016. PsychRights' Open Letter to Senator Lisa Murkowski (R Alaska), January 21, 2013. PsychRights' Letter to the President's Task Force on Gun Violence, January 7, 2013. One Drug, Two Faces, New York Times, March 25, 2008. How the Legal System Can Help Create a Recovery Culture in Mental Health Systems, presented at Alternatives 2005: Leading the Transformation to Recovery, Phoenix, Arizona, October 28, 2005. Bigley v. Alaska Psychiatric Institute, S-13116, Alaska Supreme Court Opinion No. 6374, May 22, 2009. Wetherhorn v. Alaska Psychiatric Institute, Opinion No. 6091, ruling Alaska's gravely disabled criteria unconstitutional (requiring the state prove the person unable to survive safely in freedom). Myers v. Alaska Psychiatric Institute, Opinion No. 6021, June 30, 2006, ruling Alaska's forced psychiatric drugging regime unconstitutional. We get a commission if you purchase items from Amazon.com through this link. Also see our Suggested Reading List.